Stephanie O’Dea, a New York Times best selling author, award-winning blogger, and a mom of three. She’s the author of Totally Together: Shortcuts to an Organized Life, and the Make It Fast, Cook It Slow: The Big Book of Everyday Slow Cooking. 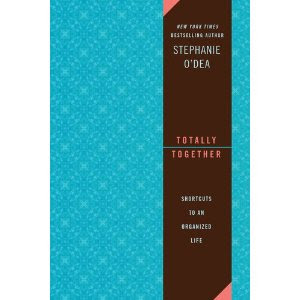 We had the opportunity to have the Totally Together: Shortcuts to an Organized Life ($10.20) sent to us. It has shortcuts to an organized life, which is something I really can use with an active five year old son taking a lot of my time. I really needed something to remind me of doctor and dental appointments that sometimes slip by me. I think this is a must-have journal for those that just can’t get organized. Go get one for yourself and those family members and friends that may want some organization tips in their lives. It will make a great Christmas gift.